Ford produced a truly unique "Blue Angels" edition 2012 Ford Mustang GT to pay tribute to 100 years of naval aviation support for education program for young aviators. The exterior of Ford’s “Blue Angels” Mustang GT was inspired by the acclaimed naval aviation performance demonstration team and the F-18 Hornet aircraft it flies. 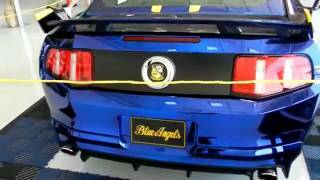 The car’s custom rear spoiler’s vertical tailfins, the “screaming yellow” gloss accents, inclusion of the Blue Angels script and crest all are drawn from the Navy aircraft. The unique chrome blue paint, courtesy of Creations n’ Chrome, is unlike anything available on a production vehicle anywhere in the world. This special edition Mustang GT will be sold at charity auction at EAA AirVenture Oshkosh on July 28. 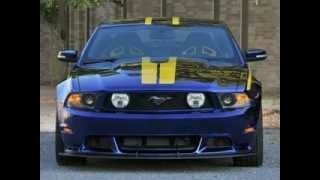 DEARBORN, Mich., July 15, 2011 – The engineering and design teams at Ford Motor Company have produced a truly unique “Blue Angels” edition 2012 Ford Mustang GT. This one-of-a-kind vehicle will be sold at the Gathering of Eagles charity auction July 28, during the Experimental Aircraft Association (EAA) 2011 AirVenture Oshkosh, the world’s greatest aviation celebration. All proceeds from the car donation and sale will benefit the EAA Young Eagles organization, which has provided free introductory flights to more than 1.6 million young people since 1992 while also teaching the value of hard work, personal responsibility and enhanced math and science skills. Ford is the exclusive automotive partner of EAA AirVenture Oshkosh, held July 25-31 at Wittman Regional Airport in Oshkosh, Wis. 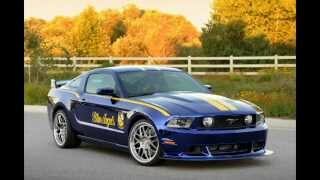 The Ford “Blue Angels” Mustang pays tribute to 100 years of naval aviation, which will be celebrated all week at AirVenture 2011 as part of the show’s Tier 1 event status from the U.S. Navy tied to its yearlong Centennial of Naval Aviation festivities. The car will be on display inside the Ford Hangar throughout EAA AirVenture. The exterior of Ford’s “Blue Angels” Mustang GT was inspired by the acclaimed naval aviation performance demonstration team and the F-18 Hornet aircraft it flies. The car’s custom rear spoiler’s vertical tailfins, the “screaming yellow” gloss accents, inclusion of the Blue Angels script and crest all are drawn from the Navy aircraft. The unique chrome blue paint, courtesy of Creations n’ Chrome, is unlike anything available on a production vehicle anywhere in the world. 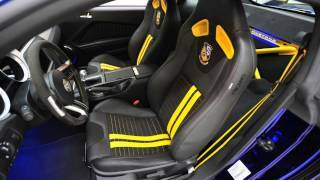 With the Blue Angels crest stitched into its leather Recaro racing seats, the car’s interior also features offset stripes inspired by pilot flight suits. Additional unique details of the “Blue Angels” Mustang include cluster graphics, performance gauges, navigation screen images, safety belt fabric, instrument panel appliqués, rear seat-delete and cross-brace, Blue Angels script in the illuminated sill plates and puddle lamps that project jet images when the doors open. 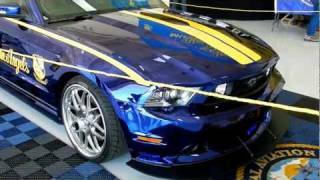 Under the hood, the “Blue Angels” Mustang is all performance with a Ford Racing supercharged 5.0-liter V8 engine producing 624 horsepower. The Ford Racing components also include a handling pack, performance exhaust and racetrack brakes. Mustang Chief Designer Darrell Behmer, Design Manager Melvin Betancourt and Chief Nameplate Engineer Dave Pericak lead the design and engineering teams that developed the “Blue Angels” Mustang. The Young Eagles Auction is part of the EAA Gathering of Eagles at the EAA AirVenture Museum. The Gathering of Eagles annually draws more than 1,000 aviation enthusiasts in support of Young Eagles and other EAA programs that inspire young people to become engineers, aviators, astronauts, scientists and innovators – the aviation pioneers of tomorrow. The “Blue Angels” edition joins three other one-of-a-kind Mustangs created by the Ford design and engineering teams for the EAA Young Eagles Auction in recent years, each generating excitement among aviation and automotive enthusiasts alike. Ford vehicles sold at auction during past EAA AirVenture events have collectively raised more than $1.3 million to support Young Eagles. Other unique vehicles produced by Ford in support of EAA Young Eagles include the Mustang AV8R, with cues from the F-22 “Raptor,” which in 2008 helped introduce the glass-roof canopy and delivered a record auction contribution of $500,000. In 2009, Ford’s AV-X10 “Dearborn Doll” Mustang was crafted in honor of World War II aircraft. In 2010, two automotive icons – Carroll Shelby, formerly a U.S. Air Force flight instructor, and Jack Roush, a longtime P-51 pilot – collaborated for the first time to create the SR-71 “Blackbird” Mustang inspired by the legendary reconnaissance jet. During EAA AirVenture, Ford also will offer attendees access to the latest advances in automobile technology at the Ford Hangar, as well as many of the industry’s most revered classics at the popular Cruisin’ Legends area on the grounds of Wittman Regional Airport. Ford activities include top-tier entertainment and interactive components that will add excitement for the hundreds of thousands of aviation fans in attendance.